As the one year anniversary of Britain’s Olympic golden summer comes around, we can all bask in the memory of such a fantastic sporting occasion. 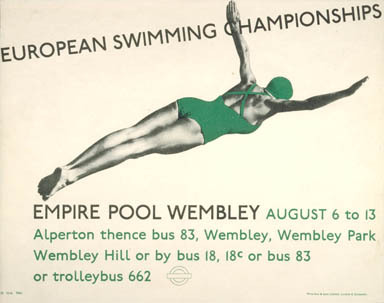 This 1938 poster publicised another exciting sporting event: the European Swimming Championships in Wembley. First held in 1926, the Championships were, and still are, deemed one of the most prestigious international swimming events. In 1938 Britain unfortunately faltered, only achieving one gold medal and finishing fifth out of eight. 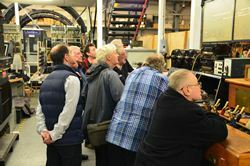 Nonetheless, the competition had suitably impressive surroundings. Built in 1933, Empire Pool was the largest indoor pool in the world and came complete with underwater illumination and space for 4000 spectators. It famously hosted the 1948 London Olympic Games swimming events, but soon after was closed down as a swimming pool. It reopened in 1978, but this time as entertainment venue Wembley Arena. Unbeknownst to revellers today, they are sitting on top of an Olympic sized swimming pool that still exists underneath their feet. The poster is indicative of the increasingly clever photography of 1930s poster designers. The two-colour panel poster creates a three-dimensional effect as the diver elegantly glides into the water. The simplistic design focuses attention onto the diver, who is a model of athletic prowess. Her costume stands out in vibrant green as a stark contrast to the white background. 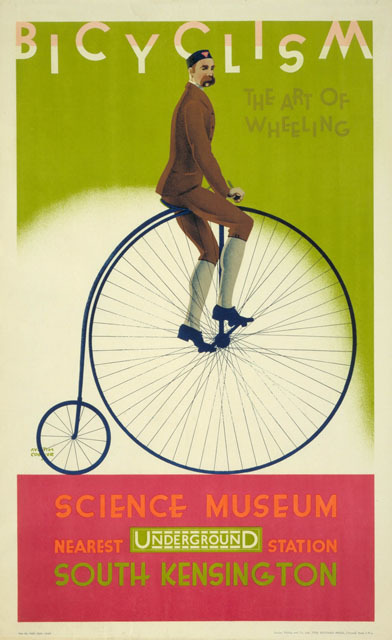 Many posters depicting sporting events were of a smaller size, in order to be used in Underground carriages. 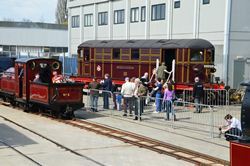 Such a simple, but striking design was perfect for enticing the glance of the passenger while they travelled. A centre for popular British sporting events, London Transport’s marketers regularly saw the opportunity to increase their ticket sales by compelling thousands of Londoners to use their handy services to reach Wembley. 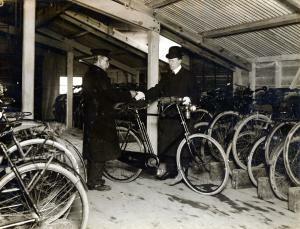 As well as advertising the Swimming Championships, they frequently publicised football matches at the nearby stadium. As our lovely art deco tube train is due for an outing on the Underground network this weekend, we are featuring one of the art deco gems from our poster collection with its rich colours and decorative style. 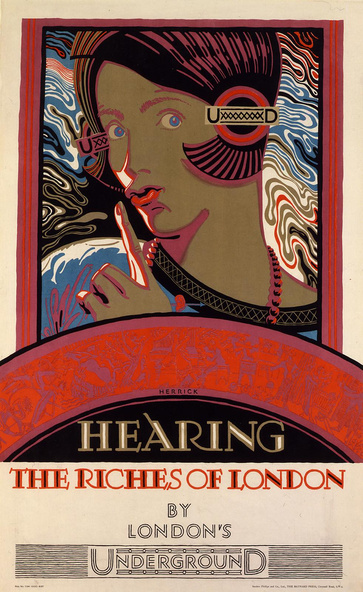 Hearing the Riches of London by Frederick Charles Herrick was produced in 1927 as part of a set of posters each representing a difference sense through which the riches of London can be experienced. The set, all designed by Herrick, promotes the sensory delights of London through touch, sight, taste, smell and in this poster, hearing. As a nod to London Underground, the woman’s hairclips are based on the infamous Roundel logo, and the arc across the centre of the poster features imagery representing the variety of music available in London. The poster is still culturally relevant for London today as it remains a key city in the international music scene, although the current genres are slightly broader than in the 1920s! Herrick designed in the region of 50 posters for London Underground between 1920 and 1933 and four of his other beautiful designs also feature in the Poster Art 150 exhibition. He was born in 1887 and trained at the Leicester School of Art, followed by further training at the prestigious Royal College of Art. Herrick was a leading graphic artist and was well known in his own lifetime. As well as producing his own work he was also a teacher in Brighton, specialising in mural work, and also at the Royal College of Art. 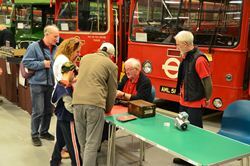 His imagery was well known not only through his work with London Underground but with London Transport in general as well as the London General Omnibus Co and other highly visible public organisations. Perhaps his mostly widely seen work was his lion design produced for the Wembley British Empire Exhibition of 1924 and 1925. 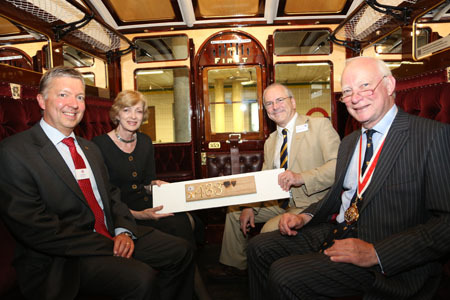 There were 27 million visitors to the actual exhibition and subsequently the design was also featured on various souvenirs including Wedgwood china. Following this commission he produced imagery for the Empire Marketing Board between 1926 and 1933 which was set up to promote trade between countries within the British Empire. Working and teaching until his later years, he died in 1970. 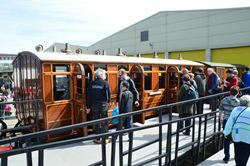 A chance to view and travel on our art deco train this weekend has proved so popular that it is now sold out, but do keep checking back to our Vehicles on the Move page for opportunities later in the year to ride the Underground on our steam train or our long serving 1938 tube stock. Summer is finally here and London is bathed in sunshine and bustling with shoppers eager to snap up a bargain. 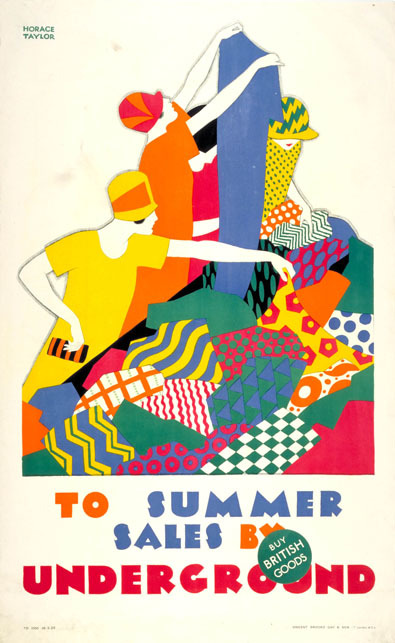 This week’s poster was created in 1926 to advertise the Summer Sales as a destination that could be reached by Underground. 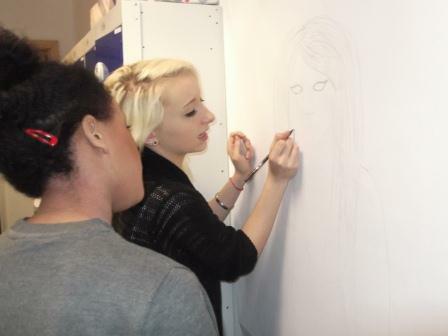 The Artist Horace Taylor started his career as a stage designer and cartoonist for the Manchester Guardian. As a commercial artist he went on to design a number of posters for the Underground Group between 1924 and 1926. The bold flat colours and simple outlines of this striking image still grabs your attention and convey a sense of modernity and style. The poster was aimed at women shopping in the West End at a time when they were increasingly seen as an important market for advertisers. The vivid yellows, bright oranges and bold prints in this design, catch the eye and reflect the summer’s seasonal trends. Fashion became increasingly attainable with the development of new fabrics such as rayon (man-made silk.) Stores would often offer other luxury services such as hairdressers and tea rooms, which transformed shopping from a menial task to an enjoyable day out. The roof of one of London’s most famous department stores is said to have hosted a terraced garden, cafes, a mini golf course and even an all-girl gun club. As shopping developed from a necessity to a popular leisure activity, many women found public transport offered them a degree of flexibility and the freedom to ‘shop til they dropped’. For the Underground Group posters provided the opportunity to increase passenger numbers during off peak hours. Today London is at the forefront of fashion design and retail enticing thousands of fashionistas to the sales every summer.